Three Dangers of Prescription Drugs | Hupy and Abraham, S.C.
What Kinds of Injuries Can Be Caused by Prescription Drugs? Many different drugs can cause serious side effects. The particular illnesses or injuries that can result from a prescription drug will be specific to the particular medication—and the list may be a long one. However, there are some serious risks that can be caused by more than one medication. These potential illnesses are so significant that we have outlined them for you here. If you have suffered any type of injury from a pharmaceutical product, then it is important to see your doctor for a prompt diagnosis and treatment plan and to contact a pharmaceutical class action attorney to make sure that your legal rights are protected before your time to file a lawsuit expires. Cancer. You didn’t expect the cost of treating one serious medical condition, such as diabetes, to be cancer. Yet some prescription medications have been linked to various forms of cancer. Heart attacks. Some medications are associated with a higher risk of heart attacks. 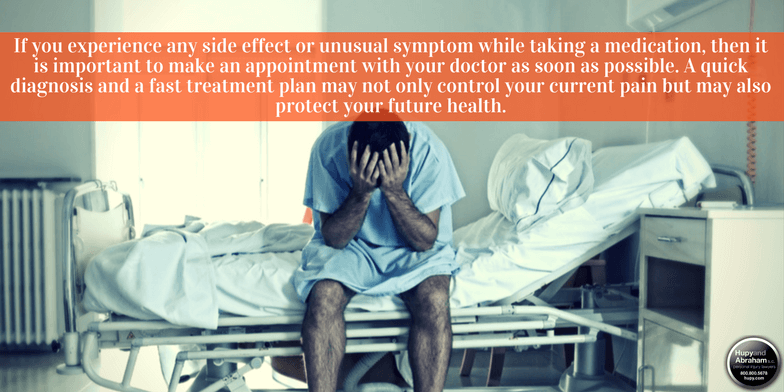 If the pharmaceutical company warns of the potential danger, then you can discuss the risk with your doctor to determine if you should take the drug. However, if you and your doctor don’t know about the risk, then your health and your life could be in jeopardy. Stevens-Johnson syndrome. This is a rare but serious condition that can result in permanent problems or death and that may be caused by certain medications. It is important to know what to do if you suffer from any of these serious—potentially deadly—side effects as quickly as possible. If you experience any side effect or unusual symptom while taking a medication, then it is important to make an appointment with your doctor as soon as possible. A quick diagnosis and a fast treatment plan may not only control your current pain but may also protect your future health. Additionally, you should contact a pharmaceutical class action lawyer in Iowa as soon as you can. You may not be the only one who is suffering from this drug. Together, you and the others who have been hurt may be able to hold the pharmaceutical company accountable and get the fair recoveries that you deserve. To learn more, please contact us any time—seven days a week—via this website or phone to schedule your free consultation. ?How much will it cost to pursue a Roundup® case? ?What should I do if I am permanently bald because of Taxotere? ?Who has the right to be part of a pharmaceutical class action case in Iowa?